Somehow, apps that offer quick reinstallation or can restore your data quickly are always in high priority on the customer demand list. 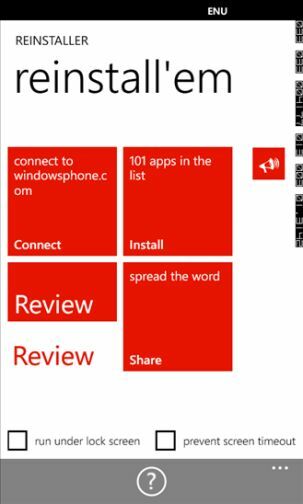 Reinstaller is a half baked solution for Windows Phone users, which can help them to reinstall Windows Phone apps and games with few hiccups. Windows Phone users are in dire situation compared to Android and iOS counterparts, where there are many featured rich applications available for them. Despite of the lack of auto installing feature, reinstaller is getting a wide recognition since it was the first of its kind app to offer such feature. In case, if you have reset your phone for one of more reason or have purchased a new phone on which you want to reinstall all Windows Phone apps and games installed from previous device, then Reinstall can help you out by lessening the burden on your shoulder. Basically, reinstaller WP app pulls down all the associated data from the Windows live account of yours. 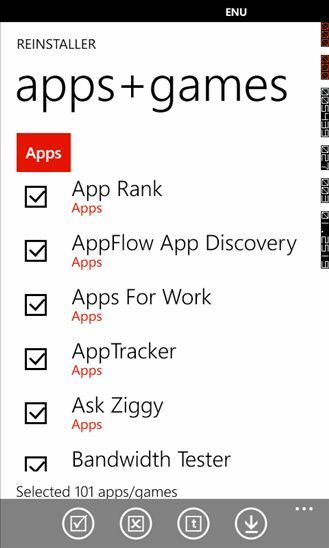 It then presents a simple option to reinstall associated Windows Phone apps and games from the history with few clicks. However, the process is not easy as you would have thought. 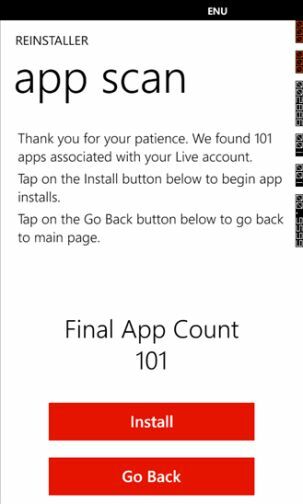 You will have to reinstall number of Windows Phone apps and games one by one, once the list is fetched from your associated Live ID. Let’s mention all the process one by one for simplification. Step 1: Download Reinstaller from marketplace. It is a free application. 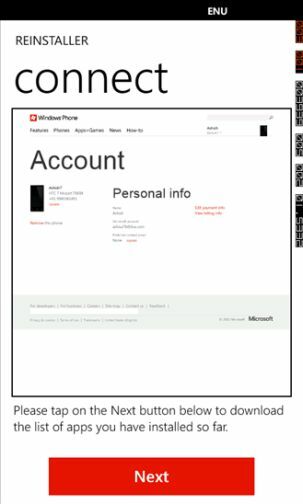 Step 3: Once you log in, reinstaller will scan your Windows phone marketplace apps and games information associated with your account or Live ID. The scanning process could a time consuming affair especially if you have installed many applications from the marketplace. This often is a pain in the back, since people like me often like to try out multiple applications and games. Step 4: It will display the number of found entries from your account. Click on ‘Install’ option at the bottom of the screen. 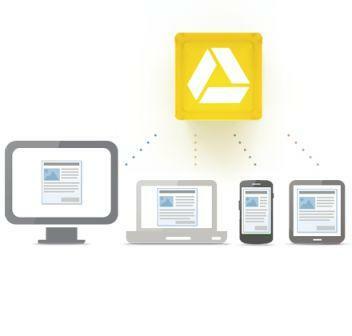 Step 5: The list of all apps and games associated with your account will be presented in front of you. There is a checkbox for you to select which apps/games to choose or skip. This again is an unproductive and time consuming process. 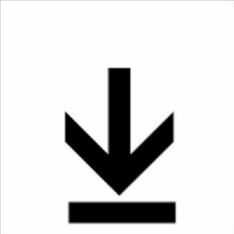 Step 6: Start downloading by clicking the icon located below. It will start downloading application one by one. The annoying thing is it will often ask you for your permission before downloading the application. The process of sending you to marketplace to confirm the installation is totally undesired and less appealing in the end-user’s perspective. Hit back button and install the rest of the application with the same process. Before you go over the board and start blaming the developer, you should cross check the fact. This is not the fault of the app developer but Microsoft. The time wasted behind going back and forth to install hundreds of apps and games is utter foolish and annoying. The application also comes with a few catches. The last two options are also very unfruitful. Let’s hope Microsoft has solved the issue in Windows Phone 8. Eager users can check out the extensive collection of WP8 handsets unveiled in 2012. The app does save lot’s of time which otherwise would have spent behind finding and installing apps one by one. 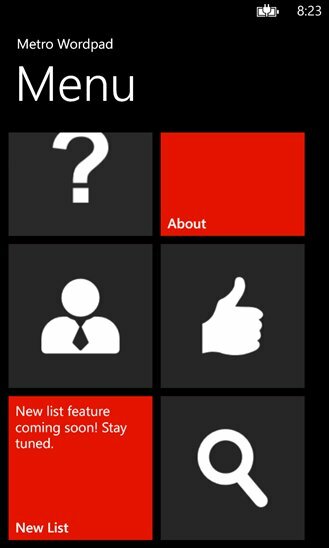 The Windows Phone ecosystem will get better and hence this application. Till then, you have to keep yourself happy with limited option at hand. Productive or unproductive, it does help you to reinstall Windows Phone apps & games quickly, which otherwise would have not been possible with normal procedure.